Q: In response to a new EU framework for investment screening proposed by the European Commission President Jean-Claude Juncker, some media speculate that such move may be targeted capitals from China and other countries. The governments of European countries and several media have stated their opposition in public, saying that obstructing investments from outside the EU is an action of protectionism and the EU should bear in mind the interests of the majority of its members in the spirit of openness rather than merely being preoccupied with short-term imbalance and the interests of a small group. What's your comment on this? A: We have noted the relevant report as well as the concerns and doubts triggered by the relevant move of the European Union among the international community, including some European countries. 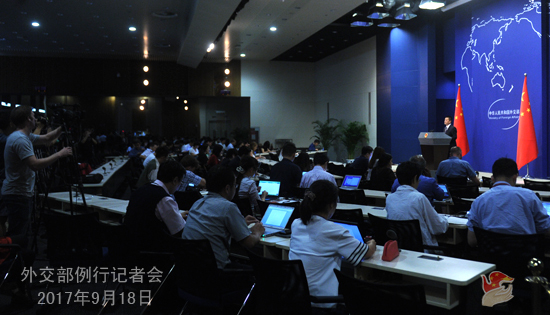 With the rapid development of globalization and the close integration of interests of various countries these days, trade liberalization and investment facilitation have become the important content of and means for optimizing world resources. In fact, the European countries have always advocated trade liberalization and investment facilitation,which has brought it tangible benefits. Developing an open world economy in which we share opportunities and interests for win-win results serves the interests of the vast majority of countries and makes an unstoppable general trend. Development cannot be achieved if the door is closed. Pursuing trade and investment protectionism for the sake of short-term interests is doomed to bring more harm than good. We hope that in making policies, the EU can observe the basic WTO principles,especially the non-discriminatory ones,avoid the disturbance of protectionism and refrain from sending wrong, chaotic and negative message to the outside world. Q: The US Ambassador to the United Nations Nikki Haley said that the US has almost exhausted all the things that it can do at the Security Council with regard to containing the DPRK ballistic and missile programs. The US is trying every other possibility that it has, and she was perfectly happy to hand the problem over to the Pentagon.What is your comment on this? A: I believe you must be very clear about China's position on the Korean Peninsula issue so I won't repeat that. The relevant resolutions adopted by the UN Security Council have demonstrated the consensus among the international community in response to the the DPRK's nuclear and missile program and reflected the shared will of the international community. The UN Security Council Resolution 2375 was just adopted not long ago. The pressing matter of the moment for all relevant parties is implementing the resolution comprehensively and strictly, rather than complicating the issue. A probe into how the Korean Peninsula issue has evolved to where it is today will find that the relevant parties have sent out threats, either in terms of rhetoric or action, to each other from time to time, which have failed to help resolve the issue. On the contrary, they have ramped up the tension and is in no way conducive to its solution. Therefore, I want to stress again that we hope various parties can implement all the DPRK-related UN Security Council resolutions in a comprehensive, accurate, strict and effective manner. Q: According to media reports, during his telephone call with the ROK President Moon-Jae in, Japanese Prime Minster Shinzo Abe said he hoped the ROK can consider the appropriate timing to provide humanitarian aids to the DPRK. Moon Jae-in responded that the offering of humanitarian aids to infants and young children and pregnant women should be separated from politics in principle. Moreover, according to reports from Yonhap News Agency, the ROK government will hold a meeting in relation to an agreement on promoting inter-Korean cooperation on September 21 to decide whether it will provide aids to the DPRK. How do you perceive the divergences between Japan and the ROK? A: We have noted the relevant remarks of the leaders of Japan and the ROK and the recent situation. I must point out in seriousness that all the previous UN Security Council's DPRK-related resolutions, including the just adopted Resolution 2375, have clearly pointed out that they are not intended to negatively affect the DPRK people's livelihood and humanitarian needs of the DPRK. We hope the relevant parties can read them attentively and implement them carefully. Over the recent period of time, we have also taken note of the positive messages sent out by President Moon Jae-in that the ROK is ready to offer humanitarian aids to the DPRK. The DPRK and the ROK descend from the same nation. 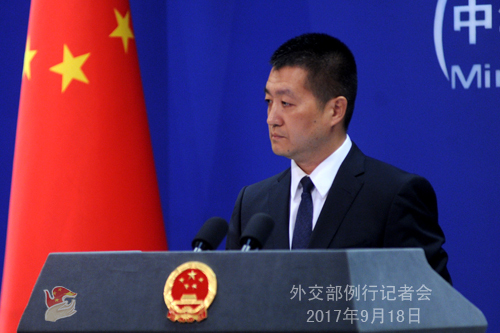 China has always supported the two sides in strengthening contact and communication, improving relationship and promoting reconciliation. We also hope the relevant parties can perceive, appreciate and respect the national sentiment of the two sides and support their normal communication. Q: According to Japanese Sankei Shinbun, the materials on comfort women submitted by civil groups from 8 countries including China and the ROK are likely to be enlisted as the UNESCO Memory of World Register after the review next month. It is said that if this application is successful, there will be increasing voice for stopping the payment of the UNESCO membership dues among the Japanese. What's your comment on this? A: It marks the memorial day of the September 18 incident today, and it is of great significance that you raised this question today. The forcefully recruiting of comfort women is a grave crime committed by the Japanese militarism during the Second World War. The iron-clad evidence can never be denied. The joint application for the enlisting of The Voice of Comfort Women into the Memory of World Register submitted by dozens of civil groups from China, the ROK and other countries and regions will help people around the world to fully recognize the cruelty of war, remember the past, cherish peace and jointly safeguard the dignity of mankind. This is consistent with the purpose of UNESCO. Paying membership dues on time and in full is the due obligation for members of international organizations. The Chinese side urges the Japanese side to faithfully fulfilling its commitment to squarely facing and reflecting upon the history, treat the application of The Voice of Comfort Women in a correct way, refrain from smearing and interfering and properly handle the issue of comfort women in a responsible way, and win trust from the international community and its neighbors in Asia with concrete actions. Q: According to media reports, the Afghan government is considering to provide training and arms to about 20,000 civilians to fight militancy in Afghanistan. How does China comment on this? A: We will continue following the relevant information mentioned in the reports. 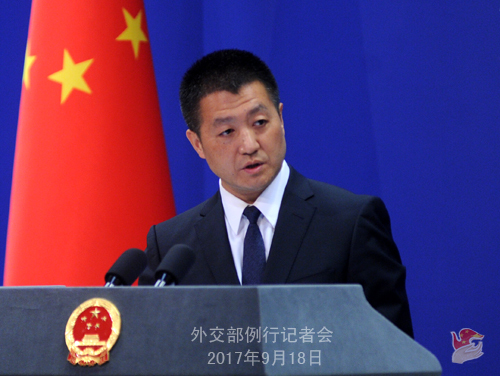 As a principle, China hopes that Afghanistan can realize peace and stability at an early date, supports the efforts of the Afghanistan's National Unity Government to uphold security at home as well as the promoting of the "Afghan-led and Afghan-owned"peace and reconciliation process. Q: The Dalian Daily newspaper reported that a Japanese national has been detained on suspicion of being involved in spying activities in China. Do you have more details about this case? Is this a new case? A: I have noted the relevant report. The relevant Chinese competent authority has conducted investigation and review on the Japanese national suspicious of being involved in behaviors that endanger national security in accordance with law and notified the relevant Japanese consulate in China in time in accordance with Agreement on Consular Relation between China and Japan.